Hyosung TNC, Hyosung Heavy Industries, Hyosung Advanced Materials, and Hyosung Chemical held three meetings with analysts from CLSA, Shinhan Investment, Mirae Asset Daewoo, and HSBC on August 27, August 30, and September 3, 2018 at Hyosung’s headquarters in Mapo-gu, Seoul. The meetings were follow-ups to the “Corporate Day” held with institutional investors on August 16, 2018 in order to have further talks on transparent management. During the meetings, the IR staff and Chief Financial Officers of Hyosung TNC, Hyosung Chemical, and Hyosung Advanced Materials presented their quarterly performances and business plans. Hyosung TNC presented its marketing strategy for boosting its marketing activities in India based on the spandex factory scheduled for completion in the country in 2019. On the other hand, Hyosung Chemical announced its plan to expand its PP business in Southeast Asia with the polypropylene and dehydrogenation facilities that are currently being built in Vietnam. Hyosung Advanced Materials also announced that it will further tap into the Vietnamese, Indian, and Thai tire cord markets. According to Hyosung Heavy Industries, it will focus more on the ESS sector where it expects to generate about KRW 270B in sales this year. "We will regularly explain the details of our companies and businesses in order to establish mutual trust between Hyosung and the markets and listen to the voice of the market," Chairman Cho Hyunjoon said. 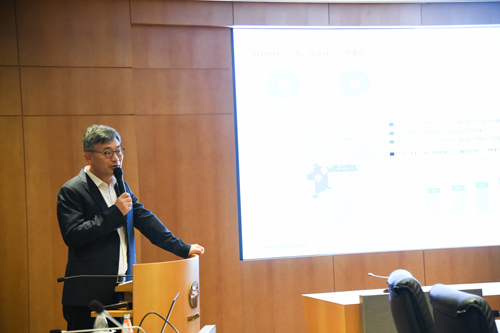 In July last year, Chairman Cho Hyunjoon organized the Transparent Management Committee and appointed an outside director as committee chairman with the goal of improving management transparency. He also made sure that the chairman of the recommendation committee is an outside director, too. In February this year, the Chairman of the Board of Directors was replaced by an outside director as well in order to do away with the customary practice of having the CEO serve as chairman of the Board of Directors.